FULL TIMEIt wasn't the greatest spectacle in very wet & scrappy conditions but the Tigers have overcome the Eagles by 17 points notching up their 4th consecutive win. Tigers InterchangeMatt Thomas off due to the blood rule. 50 out, Houli hurriedly throws the ball to his boot but his kick goes out of bounds for a throw in. Deledio has been held to just the 4 disposals since early in the 3rd quarter but unfortunately for the Eagles that has not been enough. BEHIND TIGERSConca with the inside 50 & Gordon takes the grab out in front, he lines up 40 out on a 45 degree angle but he sprays the kick to the left. After the Eagles did all the attacking it is the Tigers who found the scoreboard against the flow of play, they have a 16 point lead. GOAL TIGERSThe ball comes inside 50 for the Tigers, Riewoldt is pushed in the back in the marking contest & receives the free, he lines up from the goal square & makes no mistake of it. With just under 5 minutes remaining the Eagles are doing all the attacking but can't convert on the scoreboard, a goal to the Tigers will be enough. BEHIND EAGLESHurn with the hurried snap, however his kick starts right & stays right. McGovern with the high kick inside 50 to the top of the goal square but Chaplin takes the grab & again the Tigers work it out of defence. The Eagles are pressing but the Tigers' defence have been able to withstand every charge thus far. BEHIND TIGERSMartin with the inside 50, Deledio leads into space & takes the chest mark, he lines up from the right forward pocket but he starts the kick right & it stays right. BEHIND EAGLESLeCras sends the ball inside 50 to the top of the goal square, the ball comes off the pack & through for a behind. Each time the Eagles attempt to work the ball inside 50 the Tigers are able to get numbers back & it is cut off at half forward for the Eagles. 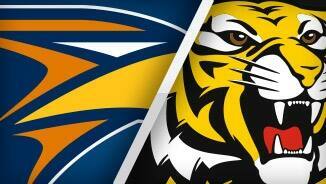 The Tigers seem to be doing enough at the moment to deny the Eagles any opportunity up forward. BEHIND TIGERSRiewoldt receives the free for in the back, he lines up from the left forward pocket but his kick goes across the face for a minor score. The ball is thrown in deep in the Eagles forward 50, with a string of handballs the Tigers cleverly work it out of defence. The Eagles trail by just 10 points & the crowd have gone up another decibel. GOAL EAGLESLeCras gets things going in the middle of the ground, they work the ball inside 50 & Darling takes the grab, he plays on & from 40 out he drills it! The Eagles are trying to work the ball forward but are struggling to get it past the middle of the ground at the moment. Shuey has returned to the field but does not look right. We are underway in the final term, Naitanui who has dominated in the ruck tonight wins the ruck contest. 3/4 TIMEThe Tigers kept the Eagles to just 1 goal for the quarter & have a handy 16 point lead in very greasy conditions. West Coast look to be another man down with Shuey going off that quarter. BEHIND EAGLESMcGinnity with the hurried snap however his kick is touched in the goal square & is through for a rushed behind. Ellis & Priddis have been the major ball winners for the Eagles having had 20 disposals apiece. SUB TIGERSRichmond have activated their sub, Lloyd receives the red vest while Gordon gets his opportunity. West Coast have had opportunities this quarter, but have not been able to hurt the Tigers on the scoreboard, they trail by 17 points. GOAL TIGERSThe ball comes inside 50 to Martin, he drops the mark but recovers maintaining possession, he unloads from 40, it's a bouncing ball through the goal square & bounces through! The ball is thrown in deep in the Eagles' goal, the Tigers win the clearance & slowly work it out of their defensive 50. The ball is thrown up 30 out from the Eagles' goal, Naitanui with the quick kick away but his kick goes out of play. BEHIND EAGLESKennedy with the hurried snap from just 25 out however his kick is offline for a minor score. The Eagles trail by 11 points. Ellis, 50 out on a 45 degree angle, he unloads but he stabs the kick, it starts right, & stays right going out on the full. BEHIND TIGERSMartin soccers the ball off the ground goal-ward but it is touched & through for a rushed behind. Shuey is in all sorts of trouble as he comes from the field in the arms of the trainers with what appears to be a left ankle injury. The Eagles have already activated their sub. LeCras is held without the ball for a long time just 40 out from goal but the umpire lets it go & the ball will be thrown up. Tigers InterchangeDylan Grimes off due to the blood rule. 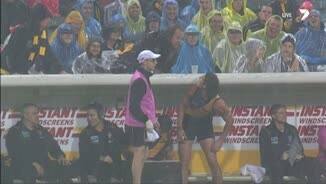 Vickery continues to cop abuse from the crowd every time he comes from the field to the bench. The handball comes out to Tunbridge, can the sub kick his second as he has a hurried snap... no, he misses everything as the kick goes out on the full. BEHIND EAGLESNaitanui sends the ball to the forward pocket, LeCras picks it up, has a snap, the kick is coming back but not enough! Priddis with the inside 50, Kennedy can't take the grab & the ball eventually spills out of play for a throw in. BEHIND TIGERSThe snap on goal falls short, Vickery & Mackenzie go sliding in the goal square, Mackenzie manages to get fingertips to the ball to force it through for a rushed behind. SUB EAGLESWest Coast have confirmed that Cox will take no further part in the match, Tunbridge was activated earlier whilst Cox underwent the concussion test. Eagles InterchangeDean Cox off due to a concussion. Welcome to Patersons Stadium for the West Coast Eagles v Richmond Round 18 clash. RICHMOND has won its fourth straight game, outlasting West Coast by 17 points in a wet-weather slog at Patersons Stadium on Friday night. The Tigers led at every change in the 8.11 (59) to 6.6 (42) victory, but the win was overshadowed by an ugly incident that saw Ty Vickery reported for striking West Coast's retiring champion Dean Cox. Vickery put himself in hot water with both the umpires and the Eagles fans following the nasty incident in the second quarter. 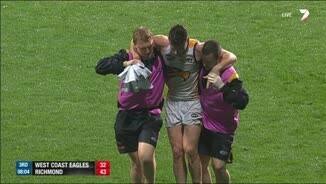 At a boundary throw-in, Cox threw his arm into Vickery's stomach. 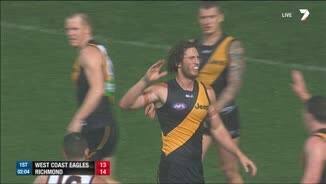 Vickery responded with a roundhouse right arm to the jaw that knocked Cox out before he hit the ground. The six-time All Australian, who announced his retirement earlier in the week, was subbed out of the game immediately with heavy concussion. Vickery was reported on the spot and the game almost came to a standstill as West Coast's players responded angrily while Cox was on the ground. Vickery served a two-match ban earlier this year for striking North Melbourne's Michael Firrito in round 12. He has 43.75 carryover points from that suspension. 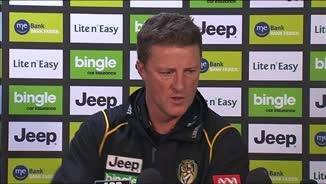 Richmond coach Damien Hardwick did not speak about the incident post-match, but he gave strong support to Vickery as a player. "I love the way Ty's been going about his footy," Hardwick said. "He has been incredible for us over the past four or five weeks. His attack on the ball's been outstanding. "Look, we'll have a look at that during the week so other people will take care of that. He's a good player for us." 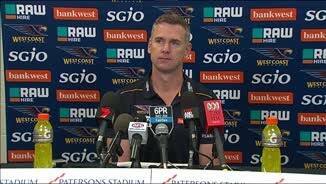 Eagles coach Adam Simpson was clearly seething about the incident, but refused to comment post-match. Both sides conceded needless free kicks after the incident. Mark LeCras bumped Vickery to give away a 50m penalty, and had his jumper ripped to shreds by Vickery's teammates. The moment seemed to galvanise Richmond, as the margin was just four points at the time of the incident. Dustin Martin kicked a goal after the half-time siren, just as Vickery had done at quarter-time, to extend the margin to 11 points, a significant advantage given the atrocious conditions. Trent Cotchin conjured a miraculous soccer goal from a tight angle straight after the break to extend the margin to a game-high 17 points, and the Eagles could not claw their way back. Vickery, who kicked two goals but was quieter after the second-term report, received plenty of attention from the Eagles' fans for the remainder of the match. The Tigers midfield was outstanding in the heavy conditions. They gathered 27 more contested possessions, with 10 Tigers hitting double figures for contested disposals. 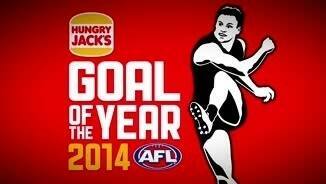 Brett Deledio, Brandon Ellis, Nathan Foley, Anthony Miles and Martin led the way. Martin kicked two crucial goals in the second and third terms, decisive moments in such a low-scoring contest. Richmond's win broke a five-game run of the teams alternating wins and losses in their head to head meetings, and improved its record against the Eagles at Patersons Stadium to 4-13. The Eagles' endeavour was never in question, but their execution let them down in their third consecutive loss at Patersons Stadium. Their final score of 6.6 (42) was their second-lowest at home in their history, while they have lost 15 of their last 21 games at the venue. "We weren't good enough in the end," Simpson said. "We had too many passengers. "We had a go, but in the end I just thought the contest, the ground ball gets, which is a combination of loose ball and hard ball gets, we got beaten pretty convincingly." Matt Priddis was phenomenal for the Eagles. He gathered 30 touches, 19 contested, and had 18 tackles, the second-most tackles in any AFL game since the stat was first recorded. Jude Bolton laid 19 tackles for the Sydney Swans against West Coast in 2011. Luke Shuey was also brave. He was carried from the ground with what appeared to be a serious left ankle injury, but returned in the last quarter with an obvious limp to fight out the game for his side. The loss ends West Coast's faint hopes of finals, while the Tigers will be pondering what might have been had they found this form earlier in the season. 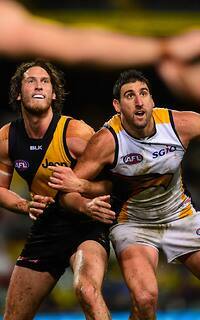 Reports: Ty Vickery (Richmond) reported for striking Dean Cox (West Coast) in the second quarter.